Bodmin Folk Club is celebrating its half-century at Wadebridge Town Hall on Saturday 19th May with an astonishing line-up which clearly demonstrates the enormous amount of goodwill that the club has generated over the years. Bodmin Folk Club was started in 1968 by a small group of traditional song enthusiasts, with the idea of attracting traditional performers to Cornwall. The club first met in the upper room of the Barley Sheaf, before moving to the Garland Ox after a particularly exuberant visit by the Padstow Old Obby Oss party resulted in the near collapse of the floor! Shirley Collins was the club’s guest on its first night at the Garland Ox, where the landlord predicted: “I’ll give it six weeks”. Little did he know the club would be very much alive and kicking 50 years later. 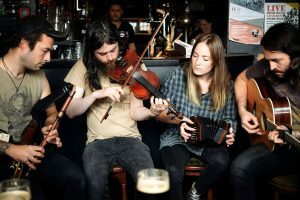 Headliners and ‘Dublin folk miscreants’ Lankum are thrice-nominated (Best Group, Best Album, Best Original Track) in this year’s BBC Radio 2 Folk Awards. Following their appearance in Wadebridge, they’ll be returning to the UK in September as the invited support act for Sleaford Mods (who probably won’t be appearing at Bodmin Folk Club any time soon!) Anglo-Australian duo Nancy Kerr and James Fagan are twice-winners of the ‘Best Duo’ category at the BBC Radio 2 Folk Awards, and Nancy Kerr was awarded ‘Folk Singer Of The Year’ in 2015. Geoff Lakeman, a long-established favourite on the West Country folk club circuit is shortly embarking on a nationwide tour with Show of Hands. Also appearing are Cornwall-based artists Tom Dale Music, Sue Frankin & Tim Brine, Rum and Shrub Shantymen, Viv Legg and Baldrick’s Plan. Admission for the afternoon concert is priced at £10 and the evening concert at £20. Purchasers who select both concerts receive a £5 discount.